Will you be attending the USCAP in Denver during March 3-5, 2008 (Monday to Wednesday)?� If so, please visit us at booth #514 and say hello.� We are also looking for staffing assistance at our booth in 2 hour stretches, for those who are familiar with our website and enjoy talking to people.� Email NatPernick@Hotmail.com if interested, and we�ll forward you more details. 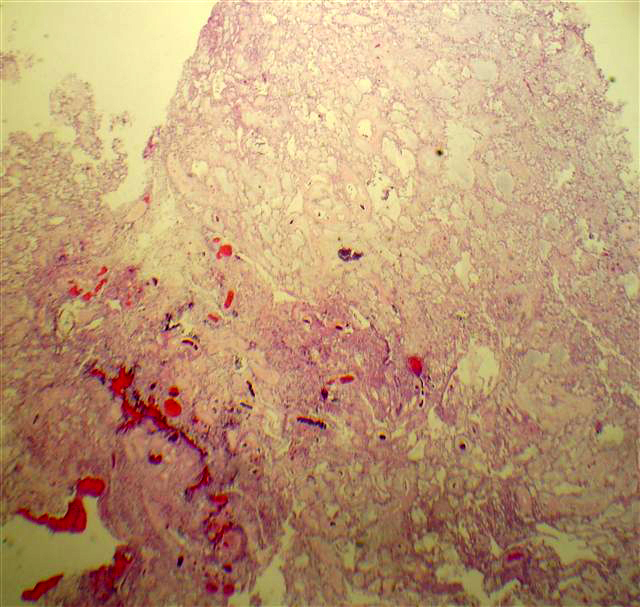 We thank Dr. Moneil Patel, New York Medical College (USA), for contributing this case. 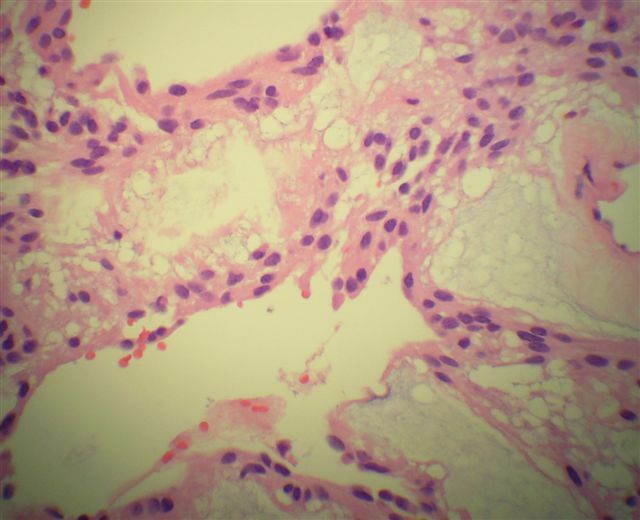 To contribute a Case of the Week, email NatPernick@Hotmail.com with the clinical history, your diagnosis and microscopic images in JPG, GIF or TIFF format (send as attachments, we will shrink if necessary).� Please include any other images (gross, immunostains, etc.) that may be helpful or interesting.� We will write the discussion (unless you want to), list you as the contributor, and send you $35 (US dollars) for your time after we send out the case.� Please only send cases with a definitive diagnosis, and preferably that are out of the ordinary. 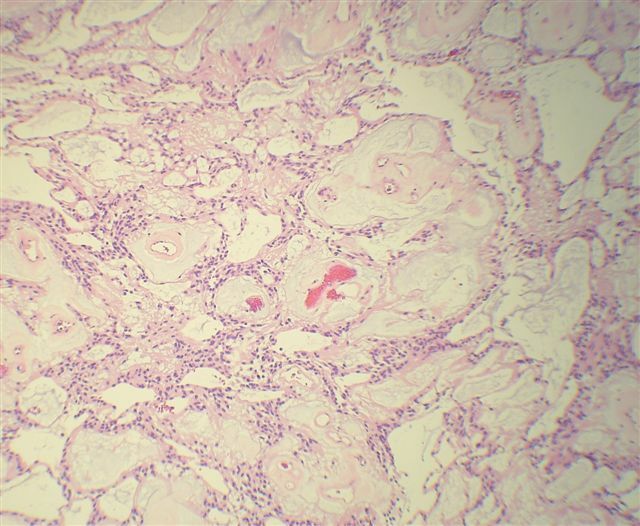 A 71 year old man with a past medical history of hypertension presented with lower back pain.� An MRI showed a T12 / L1 intradural tumor.� The operative report described the mass as a gray vascular tumor that was mobile and attached to the filum terminale. Myxopapillary ependymoma is a low grade tumor that typically occurs in the filum terminale, cauda equina, sacrum or adjacent soft tissue.� It is considered grade I of IV (WHO) at these sites, and grade II in the brain and spinal cord proper.� However intracranial primaries are very rare (Neurosurgery 2004;55:981). 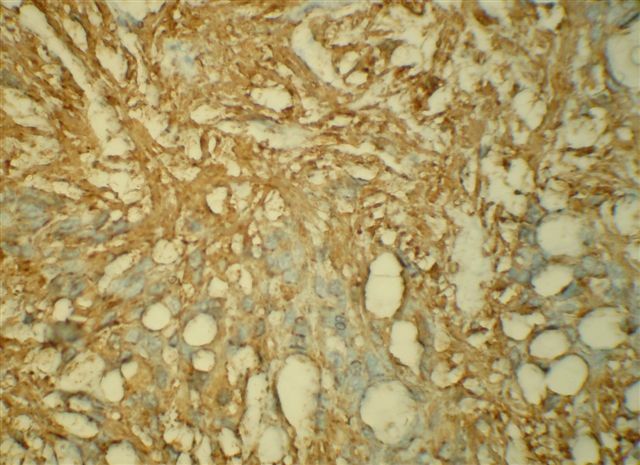 The mucin is highlighted by PAS or Alcian blue.� The tumor cells are GFAP and S100 positive. �They are negative for cytokeratins. 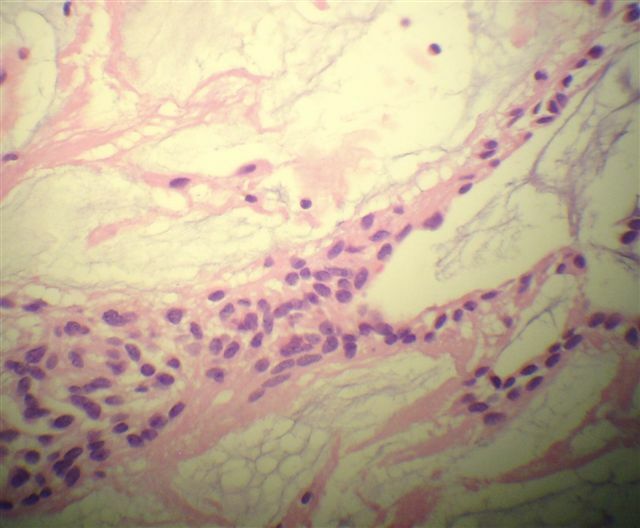 The differential diagnosis includes chordoma (see Case of the Week #110), which has cords and lobules of bubbly physaliferous cells, which are keratin positive and GFAP negative.� Some cases may resemble schwannoma focally, which is mucin negative. 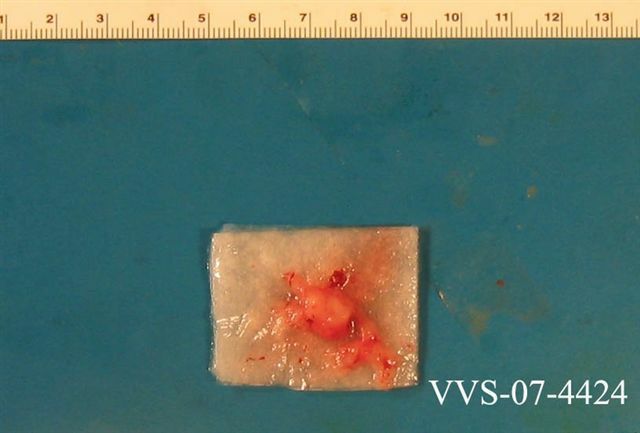 Most myxopapillary ependymomas can be totally resected by severing the filum terminale from its origin and dissecting along nerve roots, and gross total resection may be the most predictive factor for outcome (Clin Neuropathol 2008;27:21).� However, incomplete removal may cause local or widespread dissemination and distant metastases.